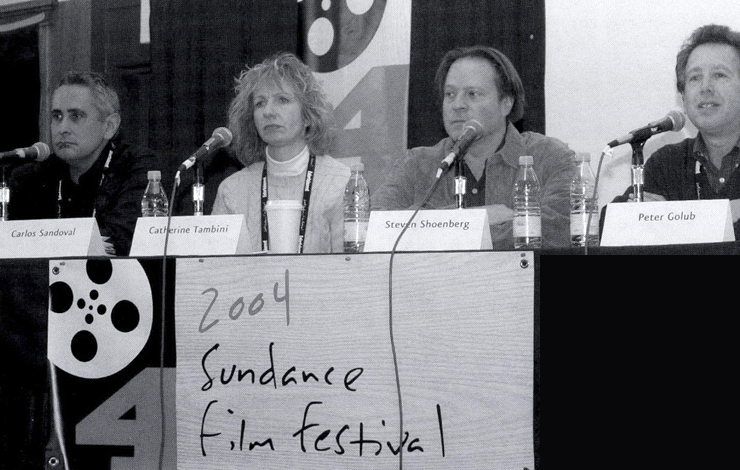 The panel "Music—The Forgotten Character in Documentary Storytelling," which took place at the Filmmaker Lodge during the 2004 Sundance Film Festival, came out of the work the Sundance Institute is doing with the Documentary Film Composers Lab. Established in 2003 as an outgrowth of the Feature Film Composers Lab, the lab brings together filmmakers and composers to work on music for documentary. This year, filmmaker Vikram Jayanti and composer Miriam Cutler were advisors at the lab and participated on the panel, along with filmmakers Jessica Yu, Catherine Tambini, Carlos Sandoval and composers Jeff Beal and Steven Schoenberg. Here's the scenario: You're making a documentary, funding is tight, timing is tight and music is one of the last things on your mind. When music is finally slapped on at the end, it neither is satisfying nor does anything to enhance the overall film. It was from this point of departure that the panel discussion began. Peter Golub, the panel's moderator and the director of the Film Music program at the Sundance Institute, opened with the claim that documentary has changed in the last few years. "One of the things going on is that a lot of the tools that were elements in fiction-making are now being incorporated into the thinking and creation of documentaries," Golub posited. "One of those tools is music, and this opens up tremendous opportunities for using music as one of the storytelling components." Yu, whose film In the Realms of the Unreal screened at Sundance, recalled how differently music was used when she first got into documentaries. "I had a friend who started out in nature documentaries, and he would joke about how you'd have these segues from subject to subject," she said. "You'd say, 'Unlike birds, fish do not fly,' and that's how music was used." The whole notion of documentary has changed, and now it's so much more important that music complement the story. Not only is music a storytelling device, but it's another character in the story: Its entry point, the mood it sets, its establishing point of view and how it makes us feel about a subject or character are just some of the ways music helps push the narrative forward. Music conveys emotion; it can build in certain places, and it can give the film space in others, thus helping the audience engage the film on a deeper level. This idea was illustrated with a clip from In the Realms of the Unreal. The film is about a reclusive artist who created a fantasy world for himself, writing a 15,000-page novel, accompanied by hundreds of paintings. The artist died alone, never having shown his paintings to anyone. Setting up the clip, Yu explained, "This is a spot where we just wanted to be able to look at the work and let the film breathe a little." Beal, who composed the score for In the Realms of the Unreal, maintained that the clip was a complex sequence because it contrasted the real world with the artist's imaginary world, and rather than make any value judgments about whether or not a fantasy life is enough to sustain a person, the music helps the audience get inside the artist's head. "At least for these two minutes the audience can just feel the joy and beauty through the images, and hopefully what the music tries to accomplish," Beal remarked. Yu and Beal began to collaborate early on, so it was clear that music was going to be an integral part of the film. They would discuss the intent of the film and how music would be used. Then, Beal would go off to explore different ideas. Tambini, who co-directed Farmingville with Sandoval, admitted, "We're at the other end of the spectrum. We brought our composer in very late, which I don't recommend." Sandoval and Tambini participated in the Documentary Film Composer's Lab this past summer. Working with Schoenberg, they learned how integral music could be. "It was pretty difficult because we had cut our film pretty much entirely without music, and having Steven come in really made a difference," Tambini said. "The re-edit that we did to the music really brought the film much more alive; it had much more of a rhythm than it had before." After showing a clip from Farmingville, a film about racial tension in a small suburban town in Long Island, New York, Sandoval explained that one of the challenges in the last sequence was to take the audience through several different moods very quickly, from a tranquil scene where people are getting along to a more pensive scene that addresses some of the continuing problems of racial hatred. Working with a composer can be an amazing experience, but the consensus from the composers and filmmakers on the panel was "don't wait until the last minute." Cutler, who has been composing music for documentaries for ten years, said that she's being brought onto projects earlier and earlier—"sometimes when there's just a rough assembly to help inform and inspire what [the filmmakers] are cutting," she said. "I think that helps you end up with a score that really can enrich the film and possibly take you in directions that you never would have imagined before." Jayanti tries to incorporate his composer before he's shot any footage. "I bring my composer in to talk about the ideas and moods I want to work with," he said. The composer will give Jayanti temp samples so that when he starts shooting he already has a musical idea in his head. Perhaps one of the most compelling reasons to start thinking about music early, the panel advised, is to avoid the pitfalls of "Temp Love." Also known as "Scratch Track Fever," it's the phenomenon of falling in love with your temp tracks (pieces of music one uses temporarily) to the point where no other piece of music will do—and then you find that the cost for the music rights exceeds your budget. If you're already set on a piece of music, it makes it harder to be open to the composer's ideas; there's also the danger that you'll want the composer to simply re-create the temp track in a way that's not do-able. The panel also advised to communicate with your composer. When you are working with a composer, don't be intimidated if you don't know music language; it's the composer's job to translate what you're saying into musical terms. Talk about emotion and how you want the piece to feel; as a filmmaker, challenge yourself to come up with words to describe the right emotions for what's going on in the sequence. Also, the panel advised, be honest with your composer; don't say you like something if that's not really how you feel. A composer who thinks that you like the music will keep on composing more of the same. It saves headache, heartache, time and money if you're honest from the beginning. When it comes to finding a composer, the panel continued, choose one with whom you feel comfortable and have a good rapport. If you listen to demo CDs, don't hire your composer solely based on what you hear. Filmmakers often make the mistake that if they don't hear music just like something they want, they figure that composer isn't a good fit. It's better to look at a complete film on which the composer has collaborated to get a sense of how music works in a particular context. Keep in mind that music for documentary is like a puzzle, the panelists summarized. Sometimes music written for one scene may work better in other scenes. Finally, pay attention to the final mix. After you've done all this work don't compromise on a mix that you aren't completely happy with. For more information on the Sundance Documentary Filmmaker's Lab and the Sundance Documentary Film Composer's Lab go to www.sundance.org.